Google has recently released some new features making it easier for parents to find family-friendly content and apps on Google Play. Parents will now be able to browse content by age and interests and access information about apps through the star badge system which reveals among other things the specific age range that the app or book was designed for and whether apps are ad-supported or not. 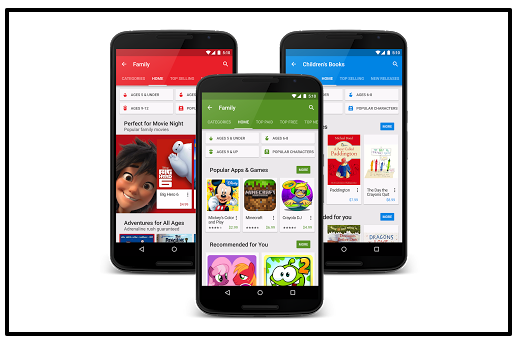 Google Play also releases new tools to empower parents and help them make infomed decisions about apps, movies and books they browse on Play Store. For instance, every app page will feature different labels informing parents about ‘new locally relevant content maturity ratings”. Also, ‘On the Apps, Games and Movies & TV homepages, you can now tap the Family button to browse the new family-friendly experiences…Google Play has also updated parental controls, so you can restrict downloads, purchases or streaming of mature content. Check out Android Official Blog to learn more about these new updates.